The mobile subscriber growth is slowing down – As per the TRAI report released yesterday, June 2011 witnessed addition of 11.41 Million new Mobile Subscribers, which is lesser than previous months. 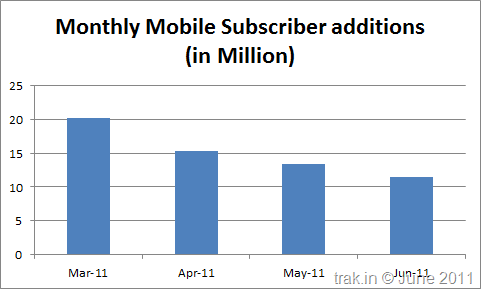 Take a look at the drop in mobile subscriber additions in last 4 months. at the end of June 2011 from 874.68 Million at the end of May 2011. Wireless (Mobile) Subscriber base grew by 1.36% to reach 851.70 Mln, while Wireline subscriber base showed negative growth of 0.11% to fall to 34.29 mln subscribers. Overall Tele-density in India reaches to 73.97 at the end of June 2011. Urban teledensity has reached 163.13, while Rural Teledensity reaches 35.60! 66% of Telecom subscribers reside in Urban areas, while 34% reside in rural! 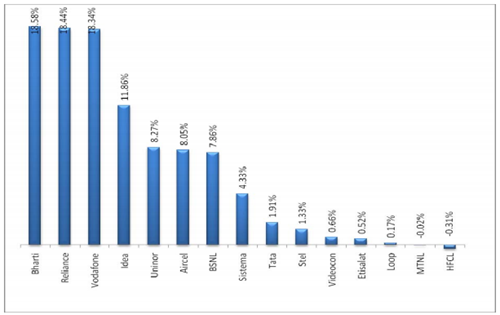 Total Indian Broadband subscriber base has increased from 12.12 million in May 2011 to 12.32 million in June 2011, there by showing a growth of 1.64. Bharti, Reliance & Vodafone all added over 2.1 Million subscribers each in month of June. More than half (55%) of all subscribers went to these 3 Operators alone. Among the smaller players, Uninor (8.27%) seems to be adding new subscribers at brisk pace. Even Sistema (MTS) is making good gains on back to some great data plans which they are offering to users on their CDMA services. What though is most surprising is Tata’s sudden failure to acquire new subscribers – Last year Tata consistently was amongst top 3 operators in terms of monthly mobile subscriber additions. But looks like it is no more consumer’s choice any more. Last month it managed a measly 2.93% additions, and this month is even worst with just 1.91% of all subscriber additions going to Tata !! The Order remains the same except for Tata’s share eroding at faster clip than rest of them. 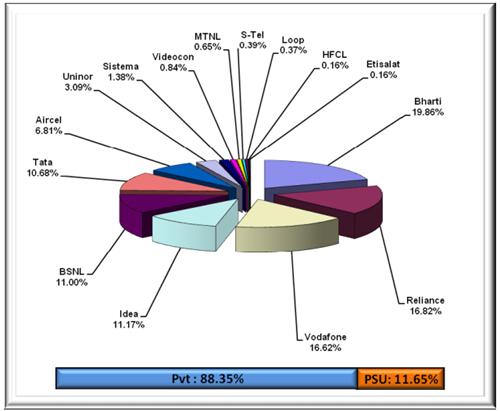 Also, PSU’s which ruled over half the Telecom market just a few years back, account for only 11.65% of the total telecom market share! 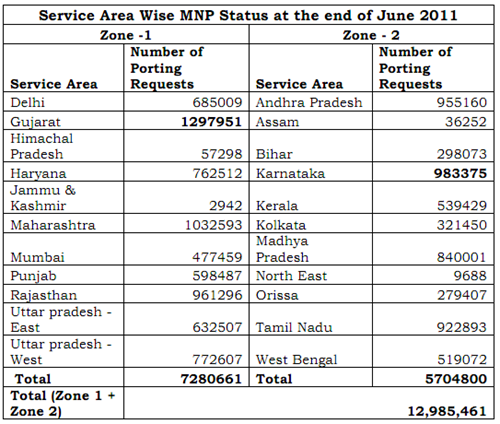 Gujarat leads in MNP requests with close to 1.3 Mln opting to change their service providers in Zone1. While in Zone 2 Karnataka leads with over 983k subscribers opting for same ! Good, people are getting smarter.They are not paying attention to attractive offers from mobile companies. And that’s why people are now using MNP option.